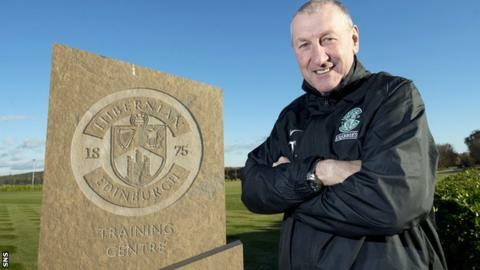 Terry Butcher aims to get more out of current Hibernian players rather than plot who can replace them in January. The Edinburgh side appointed Butcher as manager after the resignation of Pat Fenlon, but the former England captain is not thinking about the transfer window yet. "January is a long way off," he said. "I am not looking at that. "I am delighted with what I have got here, I must stress that, I am not looking elsewhere at the moment." Butcher arrived at Easter Road from Inverness Caledonian Thistle along with his assistant, Maurice Malpas. Fenlon made 10 signings over the summer, including a £200,000 move for striker James Collins. Butcher maintains everyone at Hibs will be given a chance to impress over the coming weeks. "I am looking within and saying 'what can you do, how can you improve, what will it take, and what can you give Hibernian Football Club when it comes to games? '," he said. Hibs sit in seventh place in the Scottish Premiership with 15 points from 13 games. Butcher's first game in charge is away to St Mirren on Saturday. "Maurice and I have talked about a team for Saturday," he said. "It is up to us to put out a team based on what we will have seen. "I will disappoint a lot of players when I name the team but the ones that are named need to make sure they do enough to stay there."